← Could Your City Give a Sports Team a Good Home? What if we just paid players what they were worth? The current salary system has some major flaws. Certain players are doomed to be underpaid because it is not possible to pay them what they are worth (LeBron James and Dwight Howard for instance). Young players are immediately exploited (Derrick Rose and Kevin Durant). What’s more, none of this actually helps make teams competitive! So I had a crazy thought: what if we just paid players what they were worth? The above table looks at all players that played more than 500 minutes last season. I gave every player approximately $1.7 million per win (the $2.1 billion the players got in BRI last season divided by the total wins available 1230). If a player was worth less than 0.3 Wins Produced (the threshold for the league minimum) I just gave that player the league minimum. This was because unfortunately we can’t ask bad players to pay back the team. Kevin Love, Dwight Howard and LeBron James could be worth over $40 million on the open market! Despite his slightly off year Chris Bosh was still worth the money. Even if we capped how much bad players could be paid, the NBA would have given out $31 million to players producing 0 or fewer wins! 22 Responses to "What if we just paid players what they were worth?" So a true free market would result in the owners paying less money to players? Actually I hit the problem of overpaying. The truth is that because there are negative players that the “winners” actually earn more than the market has. So by paying bad players a minimum amount we still end up either overpaying or taking money from better players. This is a market problem though. Many owners overpay or pay players that don’t deserve it. I wouldn’t be mad at the LeBrons. I’d be more mad at Bargnani’s who are getting paid mad amounts of money to make your team lose. This, of course, is the kind of pie-in-the-sky awesomeness that the NBA needs but would never have. Players paid on the basis of how much they actually contribute to winning – it’s an idea that nobody involved with the league would ever go for (not least of which players like Bargnani and Travis Outlaw and Gilbert Arenas). Just think about the consequences – there would never be any negotiations between a player and his team regarding money. They get paid based on production, period. Trades are never about money – there doesn’t need to be any CBA rules about trades, nor do teams have to consider future contract value when acquiring a player. It would only about how to contribute to wins. Awesome. BTW, it wouldn’t be difficult to tweak the system to ensure that the players (in the aggregate) are not overpaid. All you do is pay all the players the minimum, see what you have left, and then pay all the “deserving players” (i.e., those who produced wins over the approrpiate threshold, such as 0.3 wins) the appropriate portion of the remaining amount. Dre, on what basis are you claiming that salary restrictions don’t make a team competitive? Salary restrictions stop players from moving teams, because they allow small markets to keep players they can’t afford, and prevent big markets from over-spending on players to acquire them. If you add up the payroll value Memphis has acquired it is the same as the revenue listed by Forbes last year ($92m). They wouldn’t be able to keep the players they have in a correctly valued free market (not without a $30m loss anyway). In a free market LeBron would probably get closer to ~$60m, because 1) there would be a bidding war for his services and 2) he adds revenue to whatever market he is in (and he adds more revenue the larger the market he is in). New York has $78m of value on the above list, which would leave them $148m in revenue. They could overpay 5 players by $20m each in a free market and still make a profit. Also, if players get a fixed percentage of BRI AND some players are significantly underpaid because of system constraints, then over-paying other players is required to keep it in balance. It is a feature of the labour contract designed to reward veterans; you can be almost certain the majority of players don’t want a free market. That said in a free market payroll in small markets would drop until they broke even, and payroll in large markets would significantly increase (up to $150-200m in LA and New York). Overall player payments would probably increase, but that bulk would go to select individuals. This is interesting, but I’d like to know, and I suppose I could just do this myself, but I prefer when someone else does it for me :-). But I’d like to see how much teams are worth in this system. When I saw the headline I was hoping for a team by team valuation approach. And just because I’m curious – there are 1230 wins available in the league, but how close does WP come to 1230? How many wins are actually produced? Ooooh Fricktho! Thank you that’s a freaking brilliant idea! 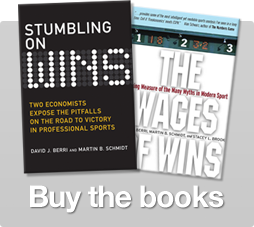 Wins Produced is very close on Wins and most years is within 5 wins of the correct amount. This last year there were 1233 Wins Produced. However as I mentioned an “issue” when it comes to pay is that some players actually cost wins and you can’t do negative compensation. Also I realize the BRI is the number the players receive but that isn’t always the case. At least it’s not always the case the BRI is reflected by their salary. The salary cap allocation (58.3*30) is $1.75 billion. The BRI is $2.1 billion. More questions. How much luxury tax was paid last season? How much goes to other teams (I assume it’s not all shared)? And how much less would the league have lost had there been no luxury tax? The Mavericks, for example, lose money regularly, but they wouldn’t if they didn’t have to pay a luxury tax. Is the tax considered a wash because it gets re-invested or does the league take most of it to pay a fraction of Stern’s salary and call it a loss? How does the luxury tax affect the aggregate bottom line? The issue is that there are systems in place to allow players to move and it turns out if these systems are in place then players will move. Back in the 70s when player restrictions were much greater there were still greats moving to big markets (Kareem and Moses). In terms of the not making teams competitive part of this has to do with teams not evaluating talent correctly. When the big market small market debate comes up everyone seems to assume that NBA management is run perfectly (which it isn’t). So in our current system teams that spend the most don’t win the most and even with rules in place players still move. Dre, the point I’d make is that teams aren’t able to evaluate talent correctly if the restrictions prevent them from doing so – or conversely, it is very hard for us to tell how they evaluate players because the system is so messed up. If you exclude all players on rookie contracts, or at (or near) their maximum salary but underpaid, how many players are actually able to be paid according to market worth? 30? 40? The other thing your analysis glosses over, is that a New York dollar doesn’t need to pay for as much as a Memphis one. In the analysis above every win is worth $1.76m. In a free market Memphis would have a disposable income of ~$60m after costs, and New York ~$180m. If Memphis aims for 40 wins ($1.5m per win) they can offer LeBron $37.5m for 25 wins. New York can aim for 60 wins ($3m per win), and offer LeBron $60m for only 20 wins. Big market teams can pay more for less and still come out ahead, even if it looks insane. I admittedly took a “reductio” approach to consider the larger question of paying guys what their true worth is (you give all the negative guys the league min, where I actually calculate how much they would have to pay back to the team), but I think we come to similar conclusions. Wow great stuff! Can’t believe I missed that! Glad to see someone else put Kevin Love on the $40+ million pay scale. Yeah the negative players are rough. I’d love a 6-8 million swing by charging Harrington to play for us. Wish it could work that way. So, just so I understand what this would me IF it was actually implemented one day: What if you had a GREAT player on a horrible team? Team still loses a majority of its games, meaning that player produces less wins…and thus is WORTH LESS? Is that correct? look, i love advanced stats (well, at least WP… not so much PER or adjusted +/-) as much as the next guy on here, but you’ve got to admit that there’s a problem when kris humphries is considered the 10th best player in the league, and landry fields the 12th. they both had great seasons, but let’s be serious: there’s a reason why dirk nowitzki (ranked 31st) is leading his team to championships and those guys aren’t. and WP misses whatever that “something” is. i’m not sure if you (dre) or dr. berri even advocate this or if it’s what you designed WP for, but the fact of the matter is you can’t use WP as a standalone evaluation of how “good” a player really is. sadly, even the lowly PER seems better at approximating a player’s overall value. Now I’ll point out we have posts and posts of analysis and we’re usually more than happy to investigate interesting problems (shout out to fricktho for this week’s topic!) but simply saying you don’t like it? No, that’s not valid and if you want to put yourself in the conversation for “advanced stats” you’ll have to do better. Thanks for reading though and please come with a better comment next time. First, allow me to explain my previous post. Rather than employing the “smell test” I was attempting to ask a question about your faith in WP. Let me rephrase my questions: if you were going to build a team for this season (assuming there is one) and you had the first pick, would you really take Kevin Love over Lebron James? Or Dwight Howard? I’m not making a statement, this isn’t a rhetorical question, I just legitimately want to know how you would choose. Similarly, you would take Humphries over Dirk? And Kevin Durant? After you answer I might have a little bit more to say on the subject. Hmmmm. Nice subject and a fun one. That said this post’s entire thesis was looking at how much players were worth for the last season. You haven’t said anything saying Humphries play this season wasn’t over Dirk’s. Same with Love over Howard or LeBron. So I’m going to decline to play here as you still haven’t brought a legitimate complaint to the table. I think that WP overvalued Kevin Love’s season. He’s a very good player, but he wasn’t the best. I’m basing that opinion on this fact: add up the WP of the entire Timberwolves team. You’ll notice that this number is significantly higher than the ACTUAL number of wins that the Timerwolves were able to achieve. I suggest that’s because Kevin Love’s stat inflation would suggest he did more to help his team win than what he actually did in reality. The reason for Kevin Love’s higher number than his team wins is 1) he had a horrible team. The Wolves would be expected win 22.3 games, so the rest of his team was worth -3 wins. 2) His team lost some close games 16 out 20, so his team was unlucky. So unfortunately I still can’t give your claim disputing WP much credence. Just noticed all the Stanford bigs in the bottom 15! How are you calculating how much money each win is worth? It seems as though you are using a constant, but research shows that wins are worth more in larger markets. An extra win in for the Knicks will bring in more revenue than that same win for the T’Wolves. This is why ultimately having the best teams in the biggest markets is ideal for a league.